What is a Cloud-Hosted Desktop? So, you want your employees to be connected anytime, anywhere, but safely and seamlessly implementing a strategy to support this dream is easier said than done. With cloud-hosted desktops businesses have a secure, flexible and agile solution to the modern way of working, but it can all seem a bit impenetrable at first! In our new whitepaper we break the term down, explaining why it’s worth looking into and which flavour you should go for. The way we work is changing. Employees – for various reasons – are no longer tethered to a desk in a centralised office; it just isn’t practical. But this creates problems – how do you keep data safe if it’s not always on-site? How do you make the reality of switching between locations and devices workable? Cloud-hosted desktop means that everything’s stored centrally, without the need for everyone to actually be central. If you’re considering taking the plunge, the first thing is to figure out which type is going to work best for you – Virtual Desktop Infrastructure (VDI) or Desktop as a Service (DaaS). VDI is where you run lots of user desktops on a virtual machine that’s stored on a centralised server. It means max control and is incredibly tailorable. This option is usually better for larger numbers of desktops; it requires more of an investment in infrastructure in the first place but that can pay off in the long run. 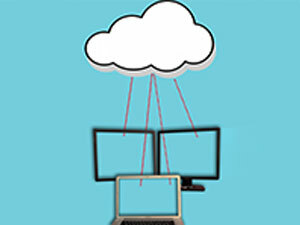 DaaS gives users access to a virtual desktop via a piece of software that they run on their device. It’s quicker to spin up and is usually better for smaller numbers of desktops – under 100 ideally. There are some key questions that can help you decide which of the two options is right for you, which are outlined in more detail in the whitepaper. If you’re wondering why you’d want a cloud hosted desktop, there are five pretty iron-clad reasons that are also laid down for you in the whitepaper; they are: security, agility, flexibility, data storage and privacy, and OpEx of cloud-hosted desktops vs CapEx of traditional desktop solutions (that last one sounds like a bit of a mouthful but isn’t as complicated as it sounds!). It also cuts out a bunch of the hassles associated with BYOD, which is also going to be increasingly important for businesses going forward. Although cloud-hosted desktops might not be right for every business there are going to be huge benefits for many, and it’s worth considering; especially when they have the potential to increase productivity and reduce problems! Download the whitepaper now for more information!